BOOK YOUR FISHING TRIP HERE! ﻿﻿Lake Tawakoni's Guide Service is North Texas Largest Fishing Guide Service - Legendary Guide and Licensed Captain Michael Littlejohn's Lake Tawakoni Guide Service is a FULL-TIME GUIDE & INSTRUCTIONAL Service on beautiful Lake Tawakoni. We are licensed Captains and Professional Fishing Guides, with a 5-Star rating from our customers on Google. Our Legendary Guides have put customers on many Tawakoni Lake Records and we are the "Home of the Lake Tawakoni Blue Catfish Record", The IGFA World Record Blue Catfish (Male Small fry World Record), The Hybrid Striper C/R Record and the White Bass Jr Angler Record. 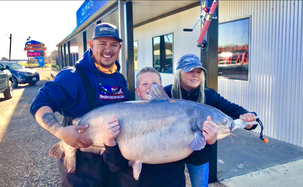 The New Texas State Record Jr Blue Catfish and the Lake Tawakoni Jr. Blue Catfish Water Body Record. Lake Tawakoni is Texas' BEST fishing Lake and is only 1 hour east of downtown DALLAS and 4 hours northeast of AUSTIN and HOUSTON and 15 minutes from Lake Fork. We offer Family Friendly fishing trips, Corporate Multi-Boat trips as well as advanced trips for serious anglers wanting to catch a fish of a lifetime! We are the LARGEST & ONLY Guide Service on the lake that specializes in Multi-Species trips including: Striper Fishing, Hybrid Fishing, White Bass, Channel Catfish, Largemouth Bass, Crappie Fishing and Monster Trophy Blue Catfish Fishing. We run ﻿﻿5 - 25ft Large Comfortable Center Console Boats with seating. Our boats provide the very best in fishing gear and latest electronics and side-imaging. Beyond being the Catfish Capital of Texas, Lake Tawakoni also boasts by far some of the LARGEST White-Bass in the state w/ some weighing in over 3lbs! Whether you're interested in catching TONS of FISH or one for the WALL, Lake Tawakoni is the place to be! © 2018 Lake Tawakoni Guide Service. All Rights Reserved. Good Fishing to All.